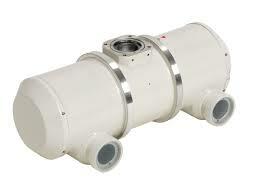 Rotating anode X-ray tube housing assembly for the purpose of general diagnostic X-ray procedures. Specially processed Rhenium-tungsten faced molybdenum target of 74 mm diameter. These tubes have foci 2.0 mm and 1.0 mm, and are available for a maximum tube voltage 125 kV with Single-phase or Three-phase generator. 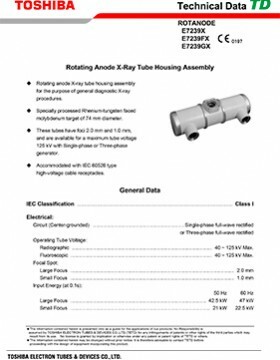 Accommodated with IEC 60526 type high-voltage cable receptacles. Radiographic: 40 ~ 125 kV Max. Fluoroscopic: 40 ~ 125 kV Max. 50 Hz – 2700 min-1 Min. 60 Hz – 3200 min-1 Min. Resistance between Housing and Low Voltage Terminals – 2 MΩ Min.